When the 4th Edition of Dungeons and Dragons was released, Wizards of the Coast attempted a dual strategy of organized play. 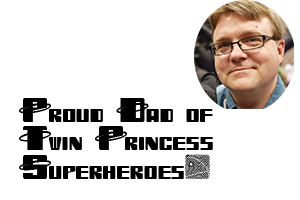 The first was to continue their Living Forgotten Realms campaign, while getting rid of Living Greyhawk and the Mark of Heroes Eberron games. The second was to run a series of "Game Day" adventures that coincided with individual products that were soon to be released. Most of these adventures were meant to be played in a single sitting of 4 hours. Many people enjoy the Living Forgotten Realms format, but the "Game Day" format was one of the things that contributed to my initial misunderstanding of the 4th Edition system. The "Game Day" adventures weren't very complex. Designing an adventure that is supposed to tell a story in four encounters -- approximately four hours of play -- isn't easy and these adventures largely suffered from this major flaw. These adventures also suffered from the fact that they were geared entirely to promoting a singular product that was being released within a week or so of the adventure. This meant that the adventures were only being written when products were scheduled for release -- and we are talking major "Players Handbook" type products not regular products. Thus these "Game Days" weren't frequent occurrences, or at least not frequent enough to build a real following. 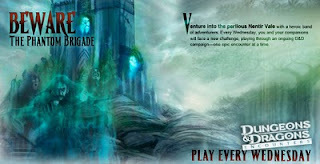 Last year, Wizards combined the regular game play experience of the Living Forgotten Realms games with the market driven adventure design of the "Game Day" adventures to create their Encounters Program. One thing that differentiated the Encounters program from other organized play events was that the individual sessions were designed to be played in 2 hours, and that each sitting was only one Encounter in a larger tale. The first two Encounters "Seasons" -- what Wizards calls the individual Adventures which last for 8 to 20 weeks of play -- were a bit of a mixed bag. The first season took place in the popular Undermountain environment, and the second took place in the fan favorite Dark Sun world, but both of these adventures missed the mark in execution -- either for story or game balance reasons. By the third season -- Keep on the Borderlands -- the Wizards staff was really beginning to hit stride. The adventure was an ambitious 20 chapter storyline that was the first adventure in the series to incorporate a robust narrative. It still contained a predictable storyline, but it was an adventure that prompted role playing more so than prior adventures and the scenes were well designed with some interesting challenges like Dragons on rooftops and using Trebuchet against mobs of attackers. The current season, March of the Phantom Brigade, is even more role play oriented than Keep and the adventure hooks for the story are fairly unique. In the most recent season, the players take the role of Pioneers seeking to create a new settlement in Nentir Vale. That's right...Pioneers...Settlers. No mere mercenary band these characters. No avenging champions seeking wrongs to right. Those may be the motivations of individuals, sure, but the tone of the adventure is open to social interaction as the players might choose sides in the leadership. Do they favor the priest founding the new "city on the hill," the ever vigilant Ranger who is there to provide protection and create the law enforcement/militia for the new society, or do they side with the historian/archeologist who wishes to study the location to learn of its past. They can befriend them all, but there are role playing hooks a plenty. Each adventure in the series has been better than the last, and each has shown a growth in the way that adventures are written for the 4th edition rules. Gone are the feelings of pure combat emulation, and in are feelings of storytelling and narrative. My hope is that Wizards will mimic the old days of TSR. In the 70s, TSR used to have adventures that they only ran at conventions. These adventures included Rahasia, the "Slave Lords" series, "Against the Giants," and "Tomb of Horrors" -- all classics in the field. These adventures gained interest through word of mouth. They were playtested by gamers at cons, then they were released for sale. Not everyone has a game store in their local community, so it would be wonderful if Wizards released these adventures -- edited based on playtesting -- some six to eight months after the seasons were over. Regardless, my local store has seen growing interest in 4th Edition since I have begun running games for them every week. Our group has a wide range of ages -- it's the first time I've gamed with high school students in quite some time. Find a store near you running the Encounters program and give 4e a try...even if you have been resisting up until now. I've been participating in D&D Encounters since the very beginning. As the DM or alternate DM I have copies of all the adventure so far. Some are definitely better than others. The 15-encounter Dark Sun adventure is really difficult, but was a lot of fun. I like your suggestion that they tweak them based on feedback from the field and then sell them as complete adventures. Apparently each of the three Dark Sun adventures are going for over $100 a piece on e-bay so there's definitely a demand for them. It seems to me that Wizards of the Coast is missing a money-making opportunity by not re-releasing them for sale.